Coal export • Critics call the deal a "shell game," but the House clears it 52-17. 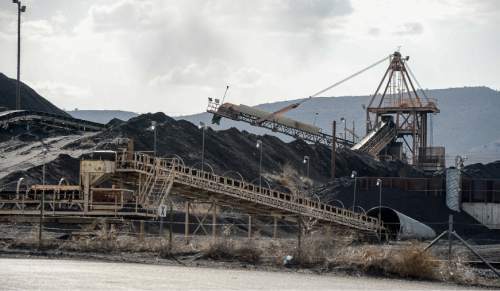 Francisco Kjolseth | The Salt Lake Tribune Coal is piled up at the Levan transfer facility along Interstate 15--south of Nephi. Francisco Kjolseth | The Salt Lake Tribune Representatives Brad Wilson, R-Kaysville, left, is joined by Mike McKell, R-Spanish For Francisco Kjolseth | The Salt Lake Tribune Coal is piled up at the Levan transfer facility along Interstate 15--south of Nephi. Francisco Kjolseth | The Salt Lake Tribune Coal is piled up at the Levan transfer facility along Interstate 15--south of Nephi. Utah Community Impact Board awarding a $50 million loan to four coal-producing counties to build a deep-water port in Oakland, Calif. that would be a shipping point for Utah coal. We want to illustrate Utah's current coal industry chain and points that might have between 1 and 3 million tons of coal moving through them in the future. 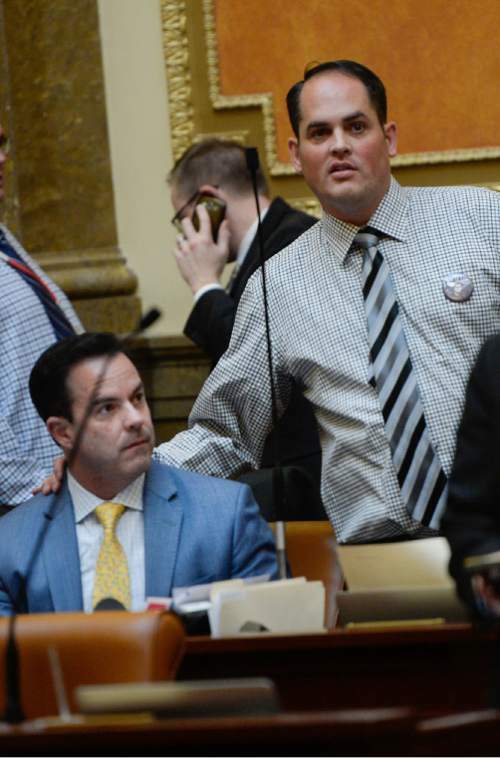 Francisco Kjolseth | The Salt Lake Tribune Representatives Brad Wilson, R-Kaysville, left, is joined by Mike McKell, R-Spanish Fork, as he watches the board while the House passed SB246, that would use sales-tax revenue to help acquire a coal port in California onThursday, March 10, 2016. Francisco Kjolseth | The Salt Lake Tribune Coal is piled up at the Levan transfer facility along Interstate 15--south of Nephi. Utah Community Impact Board awarding a $50 million loan to four coal-producing counties to build a deep-water port in Oakland, Calif. that would be a shipping point for Utah coal. We want to illustrate Utah's current coal industry chain and points that might have between 1 and 3 million tons of coal moving through them in the future. Legislators approved a fund-swapping scheme Thursday to commit $53 million to help build a deep-water port in California in the belief the project will allow Utah to sell coal and other products overseas. Critics have called it a suspect "shell game," and it has sparked an outcry from environmental groups in California and Utah that say such coal shipments would further global warming and question if there is a market for such exports. But the House gave final passage to SB246 on a 52-17 vote and sent it to Gov. Gary Herbert, who is expected to sign it. "The big gamble is not to the state of Utah," said Rep. Brad King, D-Price, who represents Utah&apos;s coal country. He argued the deal poses no risk to taxpayers because the state treasury would be reimbursed almost instantly by the Permanent Community Impact Board (CIB) with money from federal mineral royalties. These moneys were generated, King said, "by the blood, sweat [and] tears of every miner and every person who has worked in the gas and oil industry in Utah." 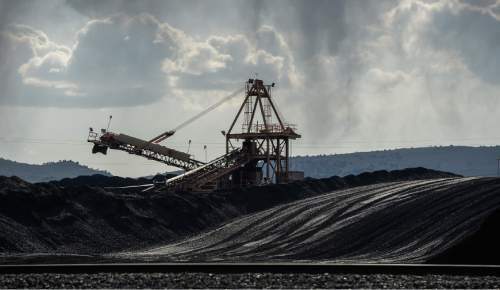 At the same time, the lone Democrat representing rural Utah said the deal has a good chance of saving jobs by opening new markets abroad for Utah coal and other products from oil to alfalfa. The complex bill first surfaced Feb. 29, eight working days before the end of the legislative session. It authorizes the swap of $53 million in state sales-tax revenue, now earmarked for transportation, for an equal amount of royalties from the CIB. The state money would be deposited into a newly created "Throughput Infrastructure Fund" that would be controlled by the CIB. Last year, the CIB approved loaning the money to four rural counties  Carbon, Emery, Sevier and Sanpete ­ to help pay for the development of the bulk-freight-loading seaport under development at the former Oakland Army Base. Typically, CIB money is granted or loaned for local projects such as roads, public buildings, water and sewer systems or parks. Environmentalists filed complaints with Utah Attorney General Sean Reyes challenging the use of CIB funds for an out-of-state project. Reyes has declined to comment on the legality, but concerns led to the unusual plan to trade royalty proceeds for state money that has fewer strings and regulations attached. Rep. Joel Briscoe, D-Salt Lake City, noted Reyes&apos; silence and complained that while the CIB "has done wonderful projects in the past, they have all been built in Utah." He questioned the soundness of the project. "If this is such a great financial investment … where are the banks stepping up to fund this program?" Some industry observers also expressed puzzlement at the deal, saying the global market for coal is drying up and international shipments have sharply tapered. "Investing in a coal terminal is like building a stateroom on the Titanic after it hits the iceberg," said Clark Williams-Derry, director of energy finance at the Seattle-based think tank Sightline Institute. He said Asia&apos;s coal imports are dropping as India boosts domestic production and China turns to other energy sources. Meanwhile, Bowie Resource Partners, which controls more than half Utah&apos;s coal production, lost its contract to supply Mexico&apos;s Petacalco power plant in 2015. But King argued that China, for one, seeks the kind of clean, low-sulfur coal that Utah produces to help reduce pollution. He said if Utah somehow could meet all of its demand, China would reduce its power-plant emissions by half. Disagreeing is Tom Sanzillo, finance director for the Ohio-based Institute for Energy Economics and Financial Analysis. "The bill has more red flags than a 10-car pileup at a NASCAR race," because of the declining coal market, he said. Matt Pacenza, executive director of HEAL Utah, expressed dismay at the Legislature&apos;s priorities. "It&apos;s distressing that legislators will throw tens of millions of dollars in public money at a doomed scheme to prop up a failing industry, yet balk at spending any resources at cleaning up our air or otherwise improving public health and the environment," he said. Utah Physicians for a Healthy Environment director Tim Wagner chalked it up as a victory for "extreme ideology and big-moneyed special interests." In contrast, Rep. Mike McKell, R-Spanish Fork, House sponsor of the bill, said Utah&apos;s coal country "is ready to be part of the global market. ... This is an important issue for rural Utah. " Rep. Rich Cunningham, R-South Jordan, said guaranteeing access to a deep-water port "gives us the ability to have a partnership like we&apos;ve never had, to continue growing, create more jobs and influence … the world." Senate Democratic leader Gene Davis, D-Salt Lake City, earlier called the trade a "shell game." "I don&apos;t understand why we feel it is important to take Utah tax dollars, dollars that are needed here in the state of Utah, no matter how we shift them around, to help build a port in Oakland. That seems like a real stretch." But Sen. Stuart Adams, R-Layton and sponsor of the bill, said the project is crucial to help Utah&apos;s coal-producing areas survive. "They are vested in coal, their economies are built on coal, their jobs, their livelihoods are dependent on coal," Adams said. "They see this as a great investment. It&apos;s their money, they can surely do what they like with it." Adams has claimed much CIB money is spent on "splash pads" and other frivolous projects.